, for collectors of pens, pencils, ink bottles, etc. and finally A Long List Of Early North American Penmakers, Volume 3. The first and second volumes are annotated, chronological lists of patents, designs, and trademarks for fountain pens, nibs, penmaking machinery, penholders, inks, ink bottles, inkwells, inkstands, ink erasers, ink eradicators, blotters, mechanical pencils, wooden pencils, pencil sharpeners, and other writing instruments and implements. Volume 2 consists of three chapters of US Patents, Designs, and Trademarks, and Volume 1 consists of six chapters of the US Patents, Designs, and Trademarks, and the Canadian, British, and French patents. 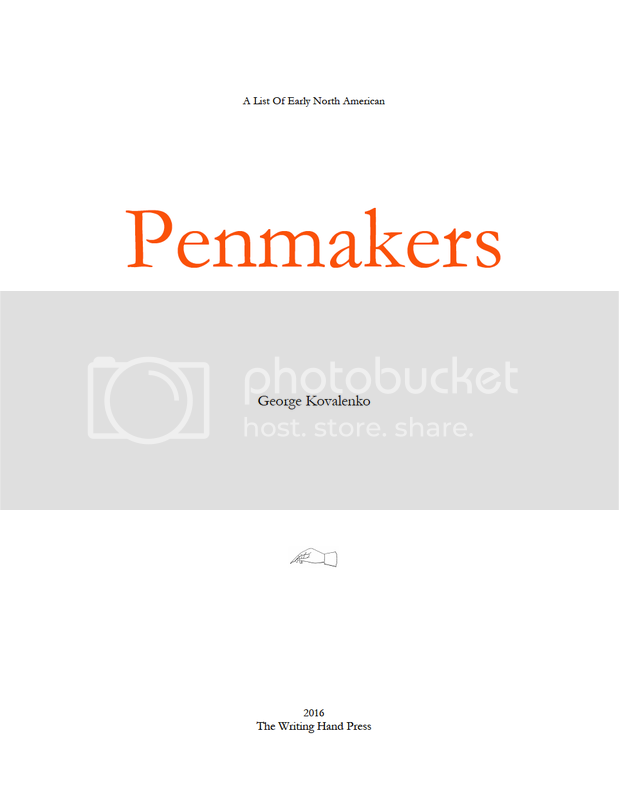 Volume 3 is an alphabetical list of penmakers with addresses and dates, and a name list of international penmakers and pen models. Here’s a list of the chapters and sections in Volume 1. There are extensive “Bibliography” and “Index” sections in both patent volumes to help locate penmakers, pen companies, and pen mechanisms. Volume 1 has a frontispiece illustration of a writing-machine automaton facing the title page, and images are placed at the beginning of every chapter and section. The books measure 11½" x 8¾", and Volume 2 is 320 pages long and weighs 3 lbs, and Volume 1 will be about 555 pages long and weigh about 5 lbs. They are printed on opaque, acid-free, archival 80 lb. paper with 12-pt Garamond type, which is very reader-friendly for tired, old eyes. They are bound in saddle-stitched, or Smythe-sewn signatures between hardback covers for maximum archival longevity. The pages lay flat for easy consultation and reading when the book is opened up and laid down on a desk. The book is a limited edition, and every copy is inscribed with an edition number in scarlet-orange ink on the Colophon page at the back of the book. The books are assigned their numbers by the order of sale. I had specially-designed, custom-fitted cardboard boxes made for shipping, so the books won’t get damaged. Anyone who has purchased a copy of Volume 2 will be first in line for the purchase of copies of Volumes 1 & 3 with the same limited edition numbers, and will be placed on a mailing list for the announcement of the publication of the forthcoming Volume 3, the list of Penmakers, coming soon. Also, those who buy both volumes of patents will be first in line to purchase a USB flash drive with approximately 1,375 PDFs of the trademarks. And as an adjunct to the patent volumes, and to facilitate searching the texts, I intend to eventually release PDFs of the three volumes on flash drive, but I will be selling it only to those who have all three volumes of the book. Here’s a photo of the frontispiece and title page of Volume 2. That’s me holding the book. Here are two examples of the page layout. They show the top half of page 1 of the patents chapter and the index in Volume 2. They give you an idea of what the pages look like on paper. Here’s a picture of the spine and binding of Volume 2, and a review of Volume 2 from the WES Journal. I will be selling the two volumes for $175.00 + $125.00 USD plus shipping. If you already have Volume 2, the new Volume 1 will be $150.00 USD plus shipping. Payment will be by bank money order, or cashier’s check. I also accept cash. I will mail the book out promptly after your payment is deposited in my bank account. The Airmail shipping and handling charge varies according to where you live, and it includes online tracking and $200.00 worth of insurance. Airmail is around $10-15.00 within Canada, $15-25.00 to continental USA, and International shipping is about $20-50.00, depending upon the distance. Airmail within Canada and to USA takes about 4-7 business days, and International Airmail usually takes about 10 business days, more or less. Xpresspost shipping is faster, but it costs around $15-25.00 within Canada, and $20-35.00 to continental USA. There is also cheaper Surface Mail for international shipments, $22.50 to everywhere else in the world, but it takes a slow 6-8 weeks. These are the shipping costs for one volume, and the cost for two volumes is a marginal few dollars more. “Tis pleasant, sure, to see one’s name in print”. –Byron. 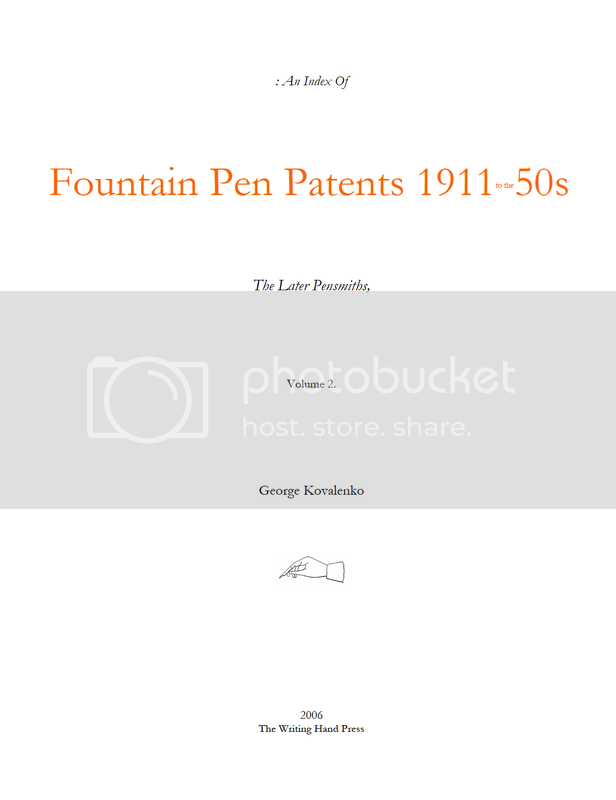 In order to facilitate my pen research, and to help other pen researchers and historians do their work, I published a book on Fountain Pen Patents 1911 to the 50s, An Index Of The Later Pensmiths, ISBN 0978113403. 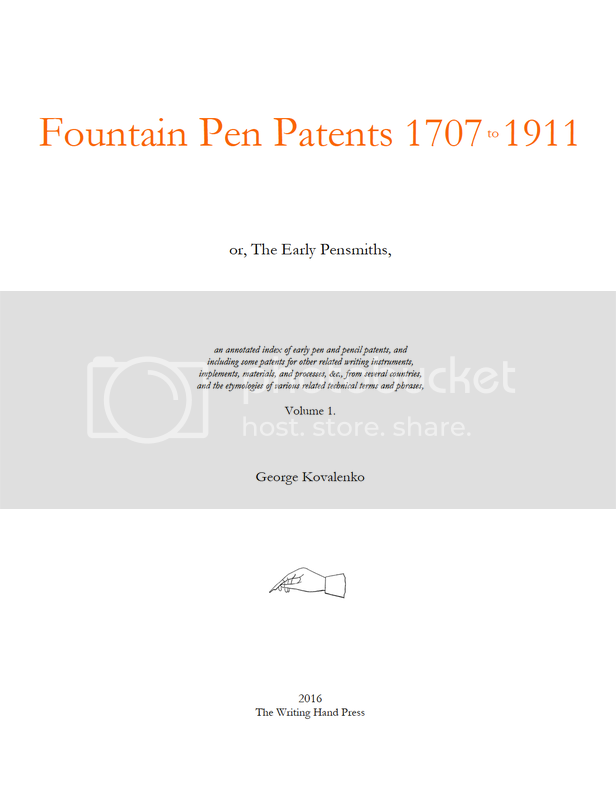 It is the second installment of a 3-volume work, an annotated, chronological list of US patents, designs, and trademarks for fountain pens, nibs, penmaking machinery, penholders, mechanical pencils, wooden pencils, inks, ink bottles, inkwells, inkstands, erasers, blotters, pencil sharpeners, and other writing instruments and implements. 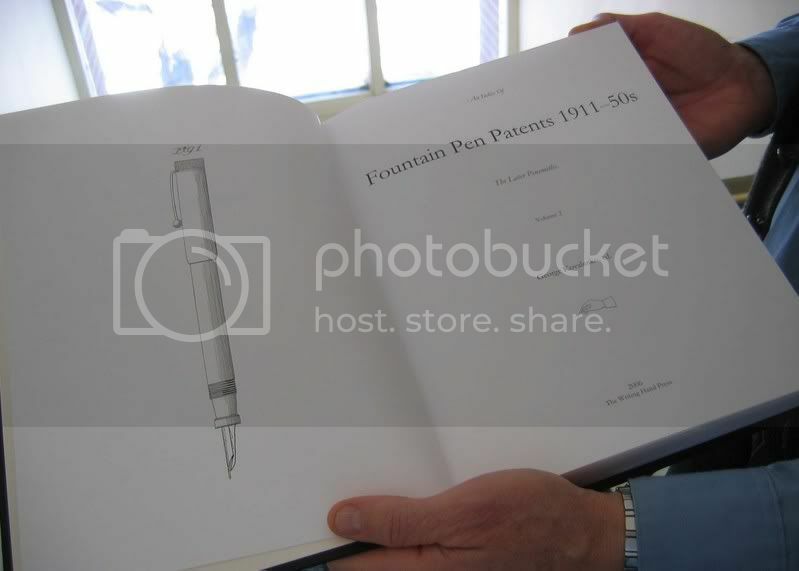 It consists of three chapters, “Patents”, “Designs”, and “Trademarks”, including those for pens made by Aikin-Lambert, Carey, Carter, Chilton, Crocker, Holland, Kraker, Mabie Todd & Bard, Montblanc, Namiki, Parker, Pelikan, Pilot, Sheaffer, Swan, Wahl-Eversharp, A.A. Waterman, L.E. Waterman, Wearever, Wirt, etc. There is an extensive “Bibliography”, and an “Index” section to help locate penmakers, companies, and pen mechanisms. There is a frontispiece illustration of a bandless Parker Duofold facing the title page, and images are placed at the beginning of every chapter and section. 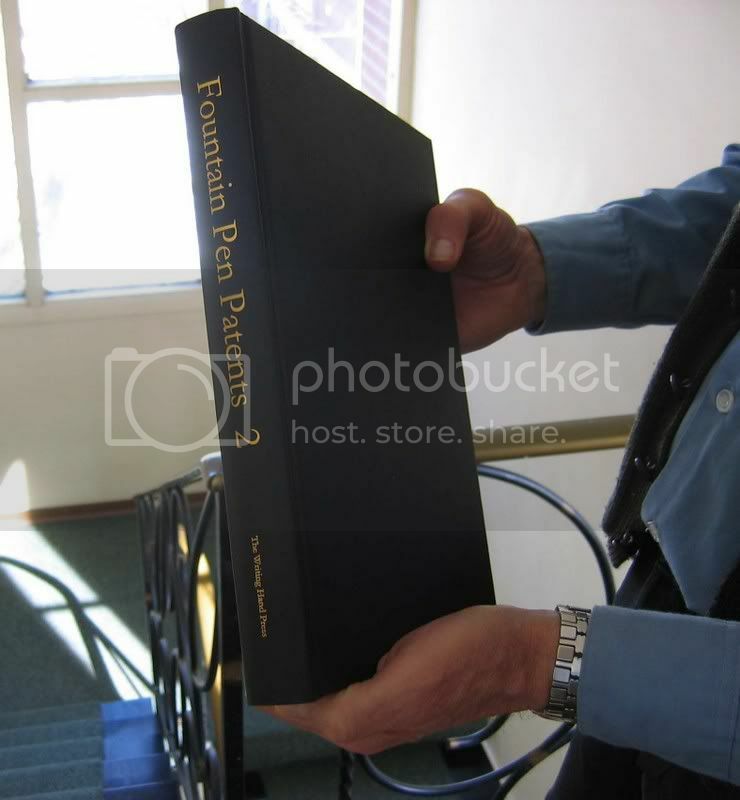 The book measures 11½" x 8¾", is 320 pages long, and weighs 3 lbs. It is printed on opaque, acid-free, archival 80 lb. paper with 12-pt Garamond type, which is very reader-friendly for tired, old eyes. It is bound in saddle-stitched, or Smythe-sewn signatures between hardback covers for maximum archival longevity. The pages lay flat for easy consultation and reading when the book is opened up and laid down on a desk. The book is a limited edition, and every copy is inscribed with an edition number in scarlet-orange ink on the Colophon page at the back of the book. The books are assigned their numbers in the order of sale. I had specially-designed, custom-fitted cardboard boxes made for shipping, so the books won’t get damaged. Anyone who purchases a copy of Vol. 2 will be placed on a mailing list for the announcement of the publication of the forthcoming Vol. 1, coming soon, and Vol. 3, the list of Penmakers. Also, those who buy both volumes of patents will be first in line to purchase a CD with approximately 1,375 PDFs of the trademarks. Here’s a photo of the frontispiece and title page. That’s me holding the book. Here are two examples of the page layout. 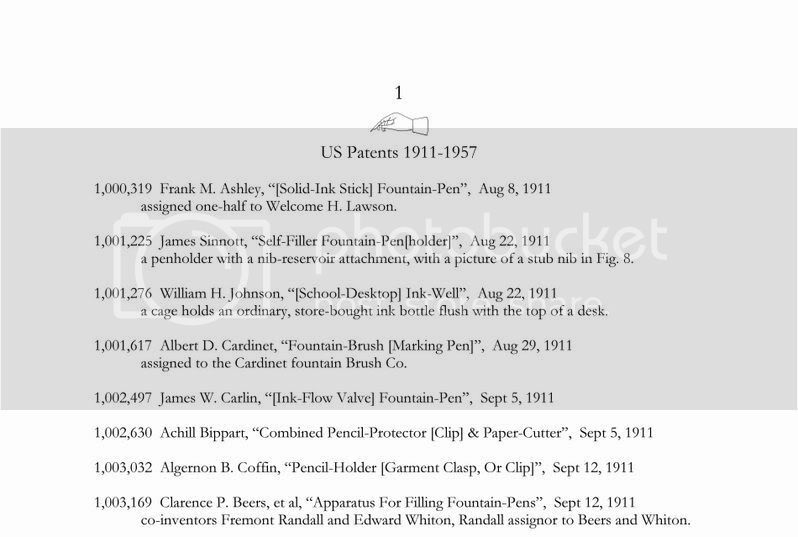 They show the top half of the first page of the patents chapter and the index, and they give you an idea of what the pages look like on paper. And here’s a picture of the spine and the binding. While I was preparing the book, I collected groups of favorite patents, designs, trademarks, and goofy images. 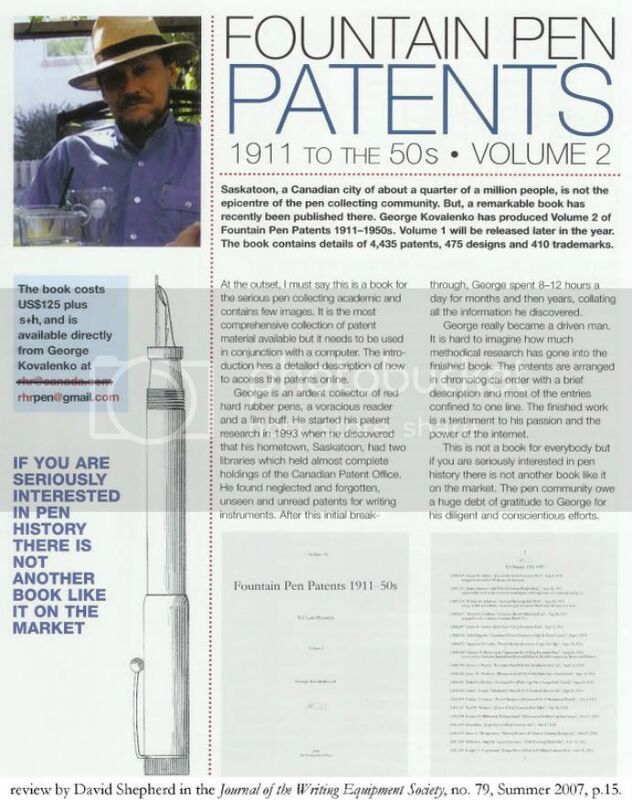 I wrote some articles about these patents, designs, and trademarks, and I posted them on various pen message boards in two series I titled “Some Of My Favorite Pen Patents” and “Some Of My Favorite Pen Trademarks”. 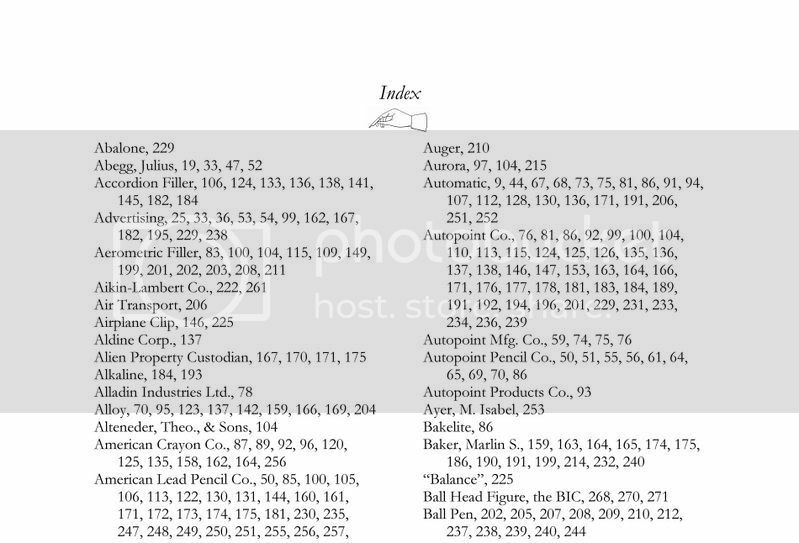 So if you want to see a few examples of the type of research that this book makes possible, take a look at these 43 links on patents, and these 43 links on trademarks, and all the other articles on my blog and my metablog. And here’s a review of Volume 2 from the WES Journal. I am selling the book for $125.00 USD plus shipping. Payment will be by bank money order, or cashier's check. I also accept cash. 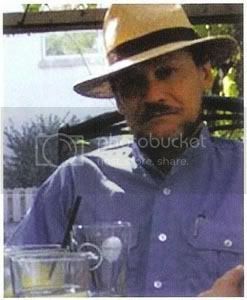 I will mail the book out promptly after your payment is deposited in my bank account. The Airmail shipping and handling charge varies according to where you live, and it includes online tracking and $200.00 worth of insurance. Airmail is around $10-15.00 within Canada, $15-25.00 to continental USA, and International shipping is about $20-50.00, depending upon the distance. Airmail within Canada and to the US takes about 4-7 business days, and International Airmail usually takes about 10 business days, more or less. Xpresspost shipping is faster, but it costs around $15-25.00 within Canada, and $20-35.00 to continental USA. There is also cheaper Surface Mail for international shipments, $22.50 to everywhere else in the world, but it takes a slow 6-8 weeks. , and pencil makers, and ink makers, etc. The first and second volumes are annotated, chronological lists of patents, trademarks, and designs for fountain pens, nibs, penmaking machinery, penholders, inks, ink bottles, inkwells, inkstands, ink erasers, ink eradicators, blotters, mechanical pencils, wooden pencils, pencil sharpeners, and other writing instruments and implements. Volume 2 consists of three chapters of US Patents, Designs, and Trademarks, and Volume 1 consists of six chapters of the US Patents, Designs, and Trademarks, and the Canadian, British, and French patents. Volume 3 is an alphabetical list of penmakers with addresses and dates, and a name list of international pen models and penmakers. And not to mention the Fountain Pen Etymologies, Volume 4, a re-arranged selection of the best articles from this blog, and some more not yet published. There are extensive “Bibliography” and “Index” sections in both patent volumes to help locate penmakers, pen companies, and pen mechanisms. Volumes 1 & 2 have frontispiece illustrations facing their title pages, and images are placed at the beginning of every chapter and section. Volume 3 has images at the frontispiece, section headings, and interspersed throughout next to the entries for the corresponding companies. The books all measure 11½" x 8¾", and Volume 2 is 320 pages long and weighs 3 lbs, and Volume 1 will be about 555 pages and weigh about 5 lbs, and Volume 3 will be about 355 pages and weigh about 3½ lbs. They are printed on opaque, acid-free, archival 80 lb. paper with 12-pt Garamond type, which is very reader-friendly for tired, old eyes. They are bound in saddle-stitched, or Smythe-sewn signatures between hardback covers for maximum archival longevity. The pages lay flat for easy consultation and reading when the book is opened up and laid down on a desk. The book is a limited edition, and every copy is inscribed with an edition number in scarlet-orange ink on the Colophon page at the back of the book. The books are assigned their numbers by the order of sale. I had specially-designed, custom-fitted cardboard boxes made for shipping, so the books won’t get damaged. I will be selling the three volumes for $175.00 + $175.00 + $125.00 USD plus shipping. If you already have Volume 2, the new Volumes 1 & 2 will be $150.00 USD each plus shipping. Payment will be by bank money order, or cashier’s check. I also accept cash. I will mail the book out promptly after your payment is deposited in my bank account. The Airmail shipping & handling charge varies according to where you live, and it includes online tracking and $200.00 worth of insurance. Airmail is around $10-15.00 within Canada, $15-25.00 to continental USA, and International shipping is about $20-50.00, depending upon the distance. Airmail within Canada and to USA takes about 4-7 business days, and International Airmail usually takes about 10 business days, more or less. Xpresspost shipping is faster, but it costs around $15-25.00 within Canada, and $20-35.00 to continental USA. There is also cheaper Surface Mail for international shipments, $22.50 to everywhere else in the world, but it takes a slow 6-8 weeks. These are the shipping costs for one volume, and the cost for each extra volume is a marginal few dollars more.